December 9, 2008 -- Amir Khadir, one of the two spokespersons for Québec Solidaire (QS), has won a seat in the Quebec National Assembly. 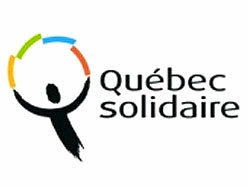 Among the many excellent aspects of the Québec Solidaire platform is a call for the Quebec government to pass a motion opposing “any Canadian imperialist intervention in Afghanistan.” The QS success represents an important advance for the social justice and anti-war movements in both Quebec and English Canada. Khadir’s victory was not just the victory of one individual. In his riding [parliamentary constituency seat] of Mercier, QS won 8861 votes, 38.06% of votes cast, defeating Daniel Turp, a star candidate of the Parti Québécois (PQ) by 872 votes. But in the ridings surrounding Mercier, QS also did extremely well. In Gouin, the other co-spokesperson for QS, Françoise David, came a very close second to the PQ winning 7987 votes (31.95%). In ridings adjacent to either Mercier or Gouin, QS won 2963 votes (13.01%) in Laurier-Dorion, 2228 votes (11.43%) in Outremont, 3009 votes (15.22%) in Saint-Marie-Saint-Jacques, 2502 votes (12.91%) in Hochelaga-Maisonneuve, and 2470 votes (8.24%) in Rosemont – more than 30,000 votes in total in these seven ridings on the Island of Montreal. There were also important results in other parts of Quebec, QS candidates polling 2241 votes (8.42%) in the Quebec City riding of Taschereau, 1995 votes (8.78%) in the Outaouais riding of Hull, 439 votes (5.04%) in the vast northern riding of Ungava, 1413 votes (5.77%) in the “near-North” riding of Rouyn-Noranda-Témiscamingue, and just shy of 2000 votes (6.46%) in Sherbrooke, the riding of Liberal premier Jean Charest. QS was formed in February, 2006. Institutionally, it was the coming together of l’Union des forces progressistes (UFP) and Option citoyenne (OC). What this fusion accomplished was to provide a space for the expression of the hopes and dreams of two generations of struggle in Quebec. Those who attended the 1000-strong eopening rally, will never forget the emotion – a video showing the history of struggle in Quebec reaching back through the tumultuous decades of the 1960s and 1970s, from the War Measures Act of 1970 and the general strike of 1972, to the women’s movement of the 1980s and 1990s, and the anti-globalisation and anti-war movements of the 21st century. There was a feeling of history being made. With a seat in the National Assembly, QS has a new tool to add to the historic commitment of the UFP to be a “party of the street and of the ballot box.” The visibility that comes from having a sitting member will propel QS into the public eye in a new way. There were some other encouraging results from the election. In particular, the right-wing Action Démocratique du Québec (ADQ), which had soared to second place in the 2007 election, saw its vote collapse by a stunning 694,487, leading to the election night resignation of leader Mario Dumont. But there remain many challenges, of which QS members are very aware. Celebrations of Khadir’s victory were tempered by disappointment over Françoise David narrowly failing to join Khadir in the National Assembly. In addition, the overall result was a majority government for Jean Charest and the Liberal Party, a leader and a party who are a known commodity in Quebec politics – committed to defending the interests of corporate power. The spectre of an economic crisis is a factor in this. Fear of recession in the absence of mass struggle means many in the electorate are looking for “safety” in the face of a stronger Liberal government. And it is probably the case that an increased number of people turned to the PQ in disgust at the federal Tories Quebec bashing in the context of the current national political crisis. Given these huge currents in the economy and in mass politics, it is remarkable that QS did as well as it did, and that Khadir was able to win a seat. There is now a more visible progressive voice that can express the concerns of working people in the face of recession and layoffs, and be a voice against war in the face of parties like the federal NDP quietly putting Afghanistan on the shelf as the price for its coalition with the federal Liberals. The story of QS needs to be given much more visibility in English Canada. Our sisters and brothers in Quebec have taken up the challenge of forging a united alternative to the traditional parties of politics, and have had some real success. Sometimes it seems that in English Canada we know more about events of this sort in Germany, Britain or France than we do about events just across the Ontario border. Hopefully the presence of Amir Khadir in the National Assembly will give QS more visibility, not just in Quebec, but in English Canada as well.